Here are a few items that appeared at the Consumer Electronics Show in Las Vegas. Check YouTube for online demos. 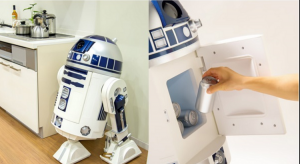 — “R2-D2 Moving Refrigerator” means no more walking to the refrigerator to get your cold soda, it comes to you by remote control. Made by Haier, it’s a faithful replica of the R2-D2 “droid” in the movie “Star Wars.” It’s a little over three feet high and can store six average cans. Its battery lasts two hours on a single charge. No pricing info yet. — The “HOM-BOT Turbo+” from LG is a robotic vacuum cleaner that comes with “augmented reality technology.” In plain English, you can talk to it. If some areas need more cleaning than others, you can crack the whip — “sweep harder” — and it will obey. — Smart TVs from LG will have a “magic zoom” that increases the size of text and pictures without distortion. (What does that caption say?) Also, find out what’s happening on ten of your favorite channels without leaving your current screen.